William Morrow & Company, 9780688124458, 240pp. 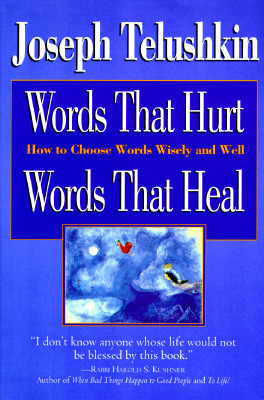 Words That Hurt, Words That Heal brings Telushkin's famously warm and erudite perspective to bear on the words we use both in public and in private, and illustrates their power to build relationships -- or tear them down. Telushkin explains the harm we do when we spread gossip, teaches why anger, criticism, and lying destroy any possibility of true communication, and shows how to turn every exchange into an opportunity. We discover subtleties of speech we may never have considered before-and we uncover the true meaning of what we say.